I have, for more than a decade, had an interesting relationship with the British Crown Dependencies of Jersey, Guernsey and the Isle of Man. From 2005 onwards I ran a campaign pointing out that none of them could comply with the requirements of the European Union's EU Code of Conduct on Business Taxation. I was right: they couldn't and by 2010 all of them had been told to reform their tax systems to meet the EU's requirements. Whether or not that would have happened without me, I do not know. I do know it made be deeply unpopular in those places. What I also know is that they became compliant by 2011 by doing two things that the EU never expected. 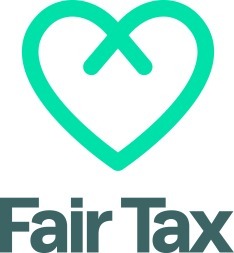 The first, with the pace being set by the Isle of Man, was to create what was, in effect, a 0% corporation tax regime for all companies located in the islands ( some tiny exceptions apart). The Isle of Man could afford to do this at the time because it was still receiving massive subsidies from the UK on its revenue sharing agreement with regard to VAT: something that I took on from 2007, and which was largely removed by 2012 as a consequence, although it is now (unfortunately) seemingly reappeared. The second thing the islands did was to, in the face of EU pressure, remove all arrangements that forced locally owned companies to pay tax when internationally owned ones did not have to do so. This was immensely costly: the result has been Jersey's ongoing budget difficulties ever since, on which issue I've also had quite a lot to say over the last decade or so. Given that by 2012 Jersey, Guernsey and the Isle of Man had all received clearance from the EU Code of Conduct Group that their tax systems were compliant with its requirements it is a little hard to see how paragraph 2.1 can now be used against these locations. However, paragraph 2.2 is another issue. What it opens up is a new 'soft' test, by which I mean that the EU Code of Conduct Group has given itself the right to decide whether, on a broader construction which no doubt considers both outcomes as well as legislation, these places are putting into place regimes that do encourage artificial relocation of profits. I confirm that they do just that. As I noted recently, corporate profits make up 67% of the GDP of the Isle of Man. For comparison, they make up 21% of the profit of the United Kingdom, which might reasonably be used as a benchmark. Jersey and Guernsey are similarly abusive, and no doubt Cayman and Bermuda are likewise. Therefore, as a matter of fact, the EU Code of Conduct Group test is failed by each of them: they do provide facilities that do encourage the artificial relocation of profits without the economic substance of the related transactions that give rise to that profit being located in the islands. The Code of Conduct Group has, then, set up a test which these islands do, as a matter of fact, fail. And the reason why they fail is inherent in the tax system that they put in place by 2012 to get round the original requirements that the Code of Conduct Group expected them to comply with in 1997. Way back then that Group made clear that differential tax rates to encourage the artificial relocation of profits were not acceptable. What they presumed would happen was that there would be a levelling up of rates: they did not expect the levelling down that actually took place. But what they are now clearly indicating is that the continuing abuse justifies further action. So what does this mean for the Crown Dependencies, in particular? I would suggest that a total reform of the corporation tax systems has to be on the cards. Firstly, they will be expected to have a corporation tax. Second, this tax will be expected to be set at a rate that does not encourage the relocation of profits. Third, as a benchmark for what that rate might be I strongly suspect that the Code of Conduct Group will look at comparable income tax rates on the island, which are 20% in each case. Anything significantly different from this will, I suspect, require some tortuous explanation. 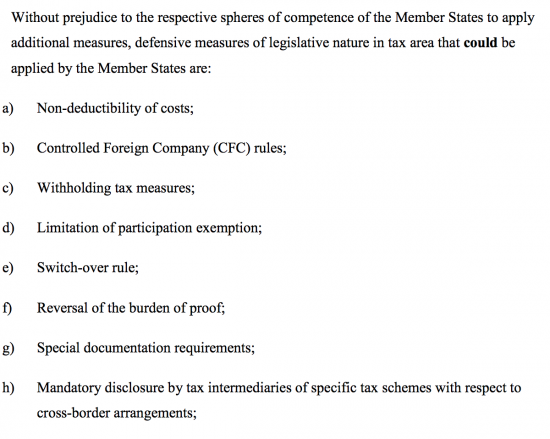 In other words, any EU country will be encouraged to disallow payments made to these places for tax purposes within their own tax regime or, even more powerfully, will be encouraged to have tax withheld from payments of interest, dividends, royalties and other such payments to the Crown Dependencies, utterly neutering their so-called status as 'tax neutral international financial centres' by ensuring that all monies they receive have been taxed before getting there. Now I am not counting my chickens as yet. First of all, the UK is leaving the EU and so these conditions will not apply to payments made from whatever is left of the United Kingdom. Second, not every EU member state may apply these sanctions. But, what is clear is that the pressure is very real, and that the sanctions are tough. I am not optimistic enough to say that this is the end of these British tax havens; they are adept at wriggling out of these situations. What I do, however, like is the form of wording chosen; the fact that the test is defined in such a way that they inevitably fail it; and that the potential sanctions are significant. Whatever other impacts the EU tax haven blacklist might have, for Jersey, Guernsey, the Isle of Man, the Cayman Islands and, no doubt in due course, the British Virgin Islands, the sanctions are draconian, and I warmly welcome them for precisely that reason. Oh so the demise of the Channel Island has been postponed again by your doomsday predictions. Turn the record over Richard, we’ve heard it all before. “In deep rouble” is a great typo. The Russian oligarchs have might also have cause to be concerned. An excellent and succinct article. These places are as slippery as a bar of soap, but decency, ethics and morality will triumph in the end and very soon this blight on humanity will be brought kicking and squealing into the civilized world. On which occasion we will drink bottles of champagne in celebration. And that is not a metaphor! Are you saying that in the early 2000s there was a time in Jersey when a locally owned business paid corporate tax, whereas a foreign-owned one in the same segment did not? That smells like fresh coffee in a jar with a 2007 sell by date. If that’s like a black hole in astronomy then it’s one that is getting bigger again. 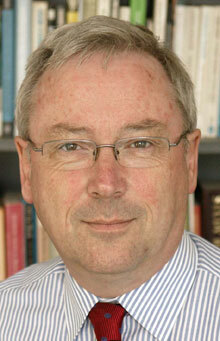 Richard if this is so serious then why aren’t they blacklisting the Channel Island today? Why wait for another year? Can’t you see that you ramblings are beginning to sound like ‘Cry Wolf’? Shall we get serious? I really do not think that the EU would blacklist a place on the basis of having given no prior notice of the requirement to change, and as far as I am aware no prior indication of this change in their approach had been given. As such immediate blacklisting would have been completely unjustified. But, as it is, the time period for compliance given is remarkably short. I should think that there is panic in St Helier, St Peter Port and Douglas tonight, whatever the official press releases might say. It’s good to hear that you are in favour of giving notice to tax changes. A year’s notice would be good for all such changes. Thank you Richard. No sign of panic in Douglas tonight. I am puzzled by your reference to the likelihood that the Crown Dependencies would need a corporate tax rate correlated to their income tax rate. There is hardly an EU country whose corporation tax rate is more than 50% of their higher income tax rate. Even in the UK, 19% corporation tax versus 45% income tax? I think it’s far more likely that the Crown Dependencies will end up with a corporation tax rate of 10% or 12.5% (see Cyprus and Gibraltar) with a full-blown territorial tax system. You yourself have confirmed several times in the past that a territorial tax system would fall within the EU Code of Conduct. There’s always the possibility of course that the Crown Dependencies will take a balanced view and decide that being on an EU blacklist isn’t such a big deal in reality. I’m not advocating that, but I strongly suspect that there will be a refusal to do anything until Netherlands, Luxembourg, Ireland and Malta are simultaneously dealt with, and there is zero appetite for that within the EU. Gibraltar secured 10% and I believe Cyprus secured 12.5%. Malta has an (effective) 5% for trading companies and 10% for non-trading companies. All have elements of territorial tax systems which still enable them to retain “offshore” business. Whether the Crown Dependencies were to opt for 10%, 12.5% or 15% barely matters – the key is a territorial tax system and I have no doubt that will be the eventual outcome. In the meantime it will be boom time for the Bahamas, Mauritius, Hong Kong and Singapore. It’s a perfect storm in their favour. I’m not sure of your of point re “elasticity of funds to tax rate”. Do you mean the collective investment fund industry? If so then there is absolutely no chance of funds being brought into the Crown Dependencies’ tax rate. Throughout the EU, funds are not subject to tax at fund level. I do indeed know that, but I still don’t know what point you were making with your comment. Can you please clarify? How much tax haven business goes for each 1% of tax charged? Is avoiding the EU tightening on Tax Havens one of the motivations behind the whole Brexit fiasco? The tax regime only needs to be re-engineered so that it won’t “attract profits without real economic activity in the jurisdiction”. A simple approach to this is to introduce a new “brass plate tax” chargeable on any company “without real economic activity in the jurisdiction”. Such a tax would mean the jurisdiction does not “attract profits without real economic activity”. The tricky bit is defining a business “without real economic activity in the jurisdiction”. If the business has employees doing a real job in the jurisdiction it would appear to satisfy the test that there is “real economic activity”. These “real jobs” would appear to be ones that further the aims of the business and would logically exclude professional directors and purely clerical work. This should protect major sectors like e-gaming, re-insurance, banking and others. It would hit the old brigade that engaged in providing companies, directors and clerical work relating to the operation of the company, a sacrifice the Crown Dependencies can probably live with. You would also need to ask if the word “profits” catches the payment of “dividends”, “interest” or “royalties” which aren’t the “profits” of the business receiving them. I suspect it probably doesn’t and would herald a new era of territorial taxation as other posters have suggested. Until we get a more detailed description of the test it is going to be hard to say what the next step will be. We will see what the outcome is, but as the document states these places have simply agreed to address issues of “economic substance”. Please be careful Richard. There was a severe and credible threat to your wellbeing not so long ago from a jurisdiction in Liverpool Bay which shall remain anonymous. Were any of the malefactors ever prosecuted? Or is it all hush hush?